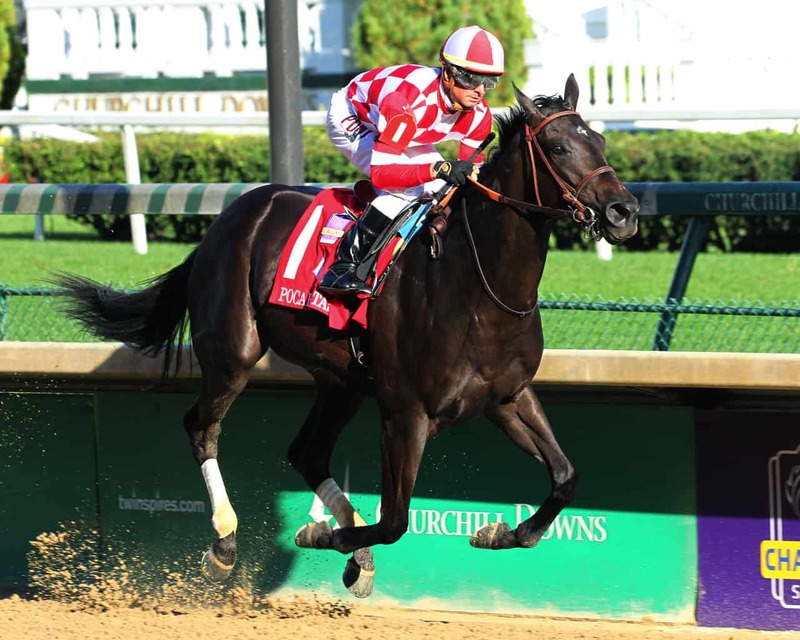 LOUISVILLE, KY – Joel Politi’s Serengeti Empress never looked less than excellent on Saturday, demolishing the field in gate-to-wire fashion in the Grade 2, $200,000 Pocahontas Stakes at Churchill Downs. The Pocahontas is a Breeders’ Cup “Win and You’re In” event, with Serengeti Empress receiving an automatic berth in the Tito’s Handmade Vodka Juvenile Fillies at Churchill Downs on Friday, November 2. Breaking sharply from the rail under Corey Lanerie as the 4/5 favorite, Serengeti Empress held a length advantage early while posting fractions of :23.17, :46.94, and 1:12.20. Beginning to widen her lead as she entered the far turn, the Tom Amoss trainee continued to draw away impressively. Crossing in a final time of 1:45.47 for the 1 1/16-mile main track event, Serengeti Empress’ margin of victory was a whopping 19 1/2 lengths. Despite being clearly outmatched on the win end, Splashy Kisses was able to get up for second by 1 1/2 lengths. Lightscameraaction headed My Wynter Rose for third, with Love My Honey another nose back in fifth. Include Edition crossed in sixth ahead of Profound Legacy, while Taylor’s Spirit took eighth. Two Dozen Roses, Tapping Pearl, and Saved At Dawn completed the order of finish. It Justhitthe Wire was scratched. The Pocahontas is also part of the Road to the 2019 Kentucky Oaks prep race season. Serengeti Empress earned 10 points for the win, with Splashy Kisses receiving 4 for second, Lightscameraaction 2 for third, and My Wynter Rose 1 for fourth. 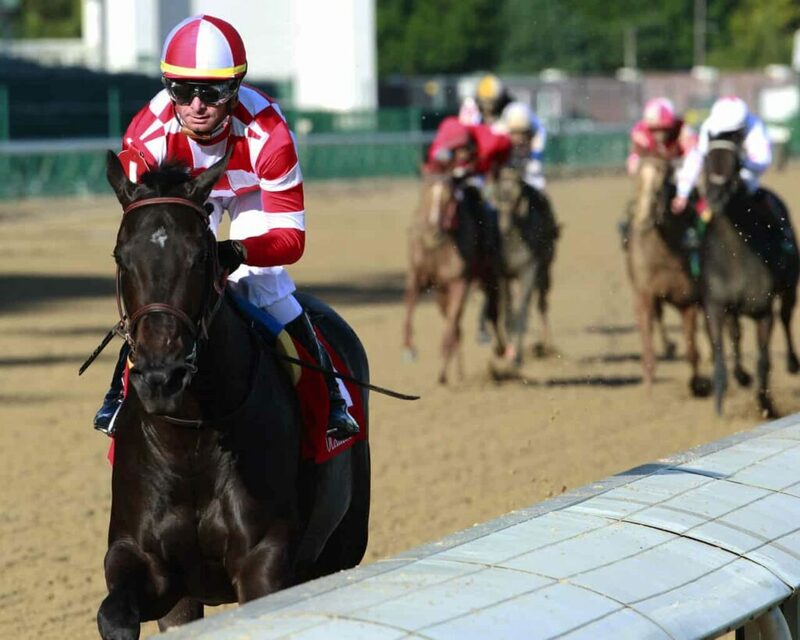 Serengeti Empress’ win was her third in four starts and her second straight dominating score, following a 13 1/2-length triumph in the $75,000 Ellis Park Debutante Stakes on August 19. The daughter of Alternation improved her record to 4-3-0-0, with her lone off-the-board performance coming two back in the Grade 3 Schuylerville Stakes, and increased her bankroll to $187,870. Serengeti Empress returned $3.80 to win, $2.60 to place, and $2.40 to show. Splashy Kisses brought back $4.20 to place and $3.60 to show, while Lightscameraaction paid $6.80 to show.